Kashmir Rowan is well-known for its rich, russet-gold colours during Autumn. 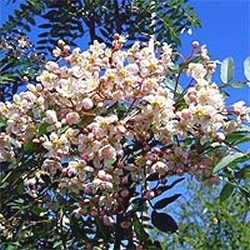 In spring, the tree is covered in clusters of pinkish-white flowers, followed by large white berries which can last well into winter. Kashmir Rowan makes a delightful tree for a small garden. Expect a final height of around 6-8 m at 10 years and about 4m wide. This tree is supplied at a height of 1.00-150cm in a 7-15L container for year round planting and better results than from bare-root stock.